The present invention relates to a vector quantization encoder and a vector quantization decoder employed for compressing and decompressing speech signals etc , and particularly to a vector quantization encode and a vector quantization decoder that can reduce the memory size of a code book used for carrying out encoding and decoding processes as well as reducing an amount of operations of the encoding and decoding processes. Generally, in a vector quantization device employed for compressing and decompressing speech signals etc , a vector quantization encoder or a vector quantization decoder has a single codebook containing a plurality of code vectors having indices. According to the indices, encoding and decoding processes are carried out. By increasing the quantity of the code vectors stored in the codebook, the quality of a reproduced speech signal may be improved. The increase of the volume of the codebook, however, increases the amount of encoding or decoding operations as well as the hardware volume, thereby impairing the practicality of the system. In designing the vector quantization encoder or decoder, therefore, it is important to maintain the quality of reproduced speech signals while suppressing an increase in the mount of operations or the hardware volume. Figure 5 shows a conventional vector quantization encode employed in a vector quantization device. In Fig. 5, the vector quantization encoder 100 includes a codebook 1 storing a plurality of code vectors Cl to Cn that are selectively output according to input indices; a synthesis filter 3 that reproduces a speech signal X from the code vector selectively provided by the code book 1; an error computing means 5 for adding the reproduced speech signal X and a wave shape of an input speech signal to be encoded to each other and computing an error between them; and an error evaluating means 6 for evaluating an error E provided by the error computing means 5. According to a gain shape vector quantization encoding technique that normalizes energy of each code vector of the codebook 1 and separates an amplification component and phase component from each other, the encoder 100 further includes a gain means 2 for multiplying a normalized code vector from the codebook 1 by a gain (a different gain value being given for each code vector). in a form of a lower left side triangle matrix where h₀,h₁,h₂,... ... are impulse responses of the synthesis filter is a filtering process, g is a gain, and Ck is one code vector of the codebook 1. Similarly, a conventional vector quantization decoder includes a codebook 1, a gain means 2, and a synthesis filter 3, which are identical with those of the encoder 100. The decoder receives an index encoded by the encoder 100, selects one of code vectors stored in the codebook 1 according to the received index, and reproduces a signal wave shape through the synthesis filter 3. The conventional vector quantization encoder or decoder has only one codebook 1. To accurately reproduce an encoded signal wave shape with such a conventional vector quantization encoder or decoder, it is necessary to reduce quantization distortion. To do so, the number of code vectors stores in the codebook 1 must be increased. To increase the number of code vectors, it is necessary to increase the memory size of the codebook 1. This may increase the length of each index, thereby increasing transmission quantities and congesting communication lines. In addition, it increases an amount of operations needed for finding an optimum index as well as a hardware volume. Prior, not prepublished EP-A-0405584 discloses a vector quantization apparatus comprising a plurality of separate codebooks providing inputs to a plurality of synthesis filters. Document "Vector quantization of speech signal in subbands" by R. Arad et al., 15th Conference on Electrical & Electronics Engineers in Israel, April 1987, discloses filtering a speech signal into subbands and VQ coding in each band. Document "Implantation et évaluation d'un algorithme de codage de parole à 16 Kbit/s pour un équipement de radiotéléphone", by T. Langlais et al., 11èME Colloque GRETSI, June 1987 discloses a speech coder where the energy of the signal in different frequency bands is VQ coded. In order to limit the size of the codebook, the input vectors are split into two vectors of smaller sizes, representing lower and higher frequency portions, respectively, and coded by appropriate, different codebooks. To solve the problems of the conventional techniques, an object of the present invention is to provide a practical vector quantization encoder and a practical vector quantization decoder for a vector quantization device that can reproduce high quality signals without increasing an amount of operations and a hardware volume. To achieve the object, a vector quantization encoder of a vector quantization device according to a first aspect of the present invention basically comprises a codebook storing a plurality of indexed code vectors and providing one of the indexed code vectors in response to an input index signal, a synthesis filter for reproducing a speech signal based on the code vector provided by the codebook, an addition means for adding a wave shape of the reproduced speech signal provided by the synthesis filter to a wave shape of an input speech signal to be encoded, and an evaluating portion for selecting a code vector index which minimizes an error power value between the wave shape of the reproduced speech signal and that of the input speech signal to be encoded and supplying the selected index to the codebook. The above codebook includes a plurality of separate codebooks each storing code vectors in a different frequency band. Each of the separate codebooks is provided with a synthesis filter. An addition means is disposed to add reproduced speech signals provided by the synthesis filters to one another and to form a reproduced signal wave shape based on which a minimum error power value is to be found. The evaluating portion includes a means for generating indices for the respective codebooks as well as indices for code vectors of the respective codebooks. According to a second aspect of the present invention, there s provided a vector quantization decoder of a vector quantization device. The decoder basically comprises a codebook storing a plurality of indexed code vectors, and a synthesis filter for processing a code vector provided by the codebook and reproducing a speech signal. One of the code vectors stored in the codebook is supplied, in response to an input index signal indicating the one code vector, to the synthesis filter, which then reproduces a speech signal wave shape based on the one code vector. The above codebook involves a plurality of separate codebooks each storing code vectors in a different frequency band. Each of the separate codebooks is provided with a synthesis filter. An addition means is disposed to add reproduced speech signals which are provided by the synthesis filters based on code vectors provided by the corresponding codebooks, to one another, thereby decoding and generating a reproduced speech signal. Unlike the conventional vector quantization technique that employs a constant number of vectors which cover full signal spectrum to be encoded and produce quantization noise spectrum irrespective of frequencies, the present invention utilizes a fact that noise in a signal band having a large power component (low-band noise) is generally not perceivable while noise in a signal band having a small power component (high-band noise) is easily perceived. Based on the fact, the present invention reduces the number of code vectors stored in a codebook for the band of large input power component to carry out rough quantization for the band, and increases the number of code vectors stored in a codebook for the band of small input power component to carry out fine quantization for the band. In this way, the present invention employs a plurality of codebooks for quantization, each of which covers a different frequency band and changes the numbers of code vectors stored in the codebooks depending on requirements, thereby reducing the memory size of each codebook and an amount of quantizing operations. Fig. 5 is a schematic view showing a conventional technique. Figure 1 is a schematic view showing a principle of the present invention. In the figure, a reference mark 10-M (M being an integer equal to or larger than 1) denotes one of a plurality of codebooks of the present invention. Each of the codebooks stores a plurality of indexed code vectors. Each codebook 10-M covers and processes code vectors of a different frequency band. If required, one of the codebooks for the frequency band having a large input power component may store a smaller number of code vectors compared to the other codebooks. In this way, the vector quantization encoder or decoder of the present invention employs a plurality of codebooks (10-1 to 10-M). According to a first aspect of the present invention, a full frequency band of input speech signal spectrum is properly divided into segments, and each of the segments is allocated to one of the codebooks. According to a second aspect of the present invention, at least one of the codebooks stores a different number of code vectors. When it is required to precisely quantize a particular frequency band of an input speech signal, or when it is allowed to roughly quantize a particular frequency band of the input speech signal, the arrangement of plural codebooks can help reduce the memory size of the encoder or decoder and a processing time. According to a third aspect of the present invention for further materializing the technical idea of the second aspect, the vector quantization encoder 100 and a vector quantization decoder 200 each employs a plurality of codebooks 10-1 to 10-M each having a different size, i.e., the different number (n1, n2, ..., or nM) of code vectors. As described before, noise in a low frequency band of an input speech signal is not perceivable, so that the low band of the signal may roughly be quantized. On the other hand, noise in a high frequency band of the input speech signal is easily perceived, so that the high band of the signal must finely be quantized. Accordingly, as shown in Fig. 2(b), the frequency band of an input speech signal is temporarily divided into a low frequency band A, an intermediate frequency band B, and a high frequency band C, and the low frequency band A is covered by the codebook 10-1, the intermediate frequency band B by the code book 10-2, and the high frequency band C by the codebook 10-3 (M). In this case, the number "n1" of the code vectors stored in the codebook 10-1 is the smallest, the number "n3 (M)" of the codebook 10-3 (M) the largest, and the number "n2" of the codebook 10-2 intermediate (n1 < n2 < n3(M)). According to a fourth aspect of the present invention, the dimensions (1) of code vectors stored in the codebooks may be differed from one another. In Fig. 1, the codebook 10-1 has a dimensional number of 11, the codebook 10-2 having 12, and the codebook 10-M having 1M (11 < 12 < 1M). Such a combination of dimensional numbers is only an example, and various combinations may be possible. Also, there are optional combinations of the numbers of code vectors (n1 to nM) and the dimensional numbers (11 to 1M). In Fig. 1, each codebook 10-M is provided with a synthesis filter 30-M to make a pair. The synthesis filter 30-M reproduces a signal wave shape based on a code vector provided by the corresponding codebook 10-M.
An addition means 40 adds signal wave shapes reproduced by the synthesis filters to one another and provides a sum of them. An error computing means 50 corresponding to the error computing means 5 of Fig. 5 computes an error between a reproduced signal wave shape Y provided by the addition means 40 and a wave shape S of a signal to be encoded. An error evaluating means 60 corresponding to the error evaluating means 6 of Fig. 5 selects code vectors for the codebooks so that a square norm of error vector computed by the error computing means 50 may be minimized. A controlling means 70 successively selects combinations of code vectors for the codebooks, reads a selected combination of code vectors out of the codebooks, and provides the read code vectors to the synthesis filters. More precisely, the controlling means 70 and error evaluating means 60 select code vectors among those stored in the codebooks 10-1 to 10-M in a way of minimizing the squared norm of error vector EK1,K2, ... ..., KM of the previously described equation. When the selected code vectors are decided to be those with which the squared norm of error vector is minimized, the error evaluating means 60 supplies indices of the decided code vectors to the codebooks to reproduce a speech signal wave shape. Practically, according to a combination of code vectors selected from the respective codebooks, a value EK1,K2, ... ..., KM for the combination is computed. Thereafter, another combination of code vectors is selected from the respective codebooks, and an squared norm E K1,K2, ... ... , KM for the combination is computed. In this way,squared norm of error vector E K1,K2, ... ... , KM are computed for all combinations of the code vectors. In the vector quantization decoder 200 (Fig. 40), the addition means 40 may compute a sum of code vectors provided by the codebooks. In this case, a single synthesis filter 30-M is disposed to reproduce a speech signal from the sum of the code vectors. When energy of respective code vectors of the codebooks is normalized, a gain means corresponding to the gain means 2 of Fig. 5 is disposed for each codebook 10-M. In the vector quantization encoder 100 of the present invention, the controlling means 70 instructs the M codebooks 10-1 to 10-M to provide a code vector Cki each. Thereafter, each of the synthesis filters 30-1 to 30-M filters a corresponding code vector Cki to provide a corresponding signal wave shape Xi(Si = H·Cki) where H is a impulse response matrix of the synthesis filter 30-i, which is multiplied by a gain gi if a gain means is disposed)(i = 1∼M). In this way, the synthesis filter 30-i reproduces the signal wave shape Xi based on the corresponding code vector selected from the codebook 10-i. The addition means 40 computes a sum of the signal wave shapes Xi and provides a reproduced signal wave shape. The error computing means 50 computes an error vector between the reproduced signal wave shape and the wave shape of a signal to be encoded. Among errors thus computed, the error evaluating means 60 detects a minimum one and specifies a combination of code vectors of the codebooks that provides the minimum error. A combination of indices corresponding to the specified code vectors of the codebooks is encoded into a code to be transmitted. The vector quantization decoder 200 of the present invention employs codebooks 10-1 to 10-M of the identical number and arrangement as those of the vector quantization encoder 100. When the codebooks of the decoder 200 receive the code representing the combination of the code vector indices, the respective codebooks provide code vectors specified by the received indices to corresponding synthesis filters 30-i(i = 1∼M). In this way, each of the codebooks 10-i provides one code vector Cki. According to the same process as the encoding process, the synthesis filters 30-i filter the provided code vectors Cki and reproduce corresponding signal wave shapes Xi. An addition means 40 computes a sum of the signal wave shapes Xi, thereby reproducing a wave shape of the signal to be decoded. The addition means 40 of the vector quantization decoder 200 according to the present invention may compute a sum of code vectors provided by the codebooks 10-i(i = 1 ∼M). In this case, a single synthesis filter filters the sum of the code vectors, thereby reproducing a wave shape of the signal to be decoded. 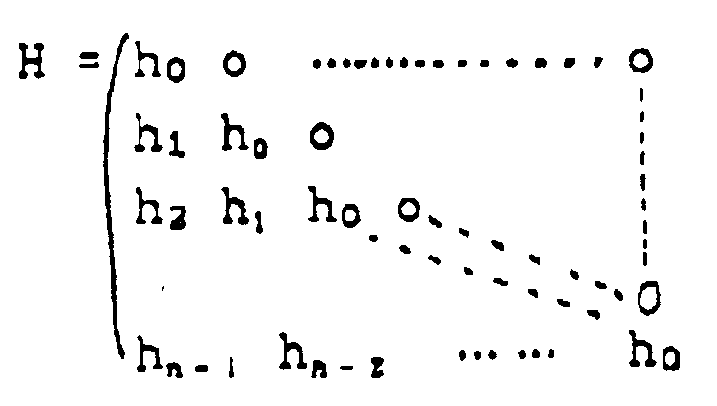 As described above, the present invention has a plurality of codebooks 10-1 to 10-M used for encoding or decoding processes. The addition means 40 of the present invention achieves the same controlling function as that provided by one disposed in the conventional single codebook structure. Supposing the conventional codebook controls 210 code vectors, the present invention controls the same code vectors with, for example, two codebooks in which one codebook 10-1 controls, for example, 25 code vectors for low frequency band and the other codebook 10-2 controls the remaining 25 code vectors for high frequency band. Consequently, the number of code vectors stored in each codebook 10-i can remarkably be reduced compared to the conventional single codebook arrangement. This greatly reduces the memory size of the codebook 10-i. According to the present invention, each codebook 10-i does not cover full input signal spectrum band width but, for example, the codebook 10-1 controls code vectors in a band from 0 KHz to 4 KHz, and the codebook 10-2 controls code vectors in a band from 4 KHz to 8 KHz. In this way, each codebook covers code vectors of its own band. As is well known as Shannon's sampling theorem, a continuous signal must be sampled at a frequency two times the maximum frequency of the signal to be sampled. In encoding a signal having a maximum frequency of 8 KHz, therefore, the conventional single codebook structure for covering whole signal spectrum must store code vectors sampled at 16 KHz. On the other hand, the codebook 10-1 of the present invention(for above exampl case of M = 2) may store code vectors sampled at 8 KHz that is twice 4 KHz, and the codebook 10-2 may store code vectors sampled at 16 KHz that is twice 8 KHz. As is apparent from this example, according to the codebooks 10-i of the present invention,(i =1 ∼n) the dimension(1i in Fig. 1) of each code vector can be shortened compared to that of the conventional codebook. From this point also, the present invention can greatly reduce the memory size of each codebook. In addition, the present invention sets the number of code vectors stored in one codebook that covers a band of large input power component to be smaller than those of other codebooks. Generally, noise in a signal band having a large electric power component is not perceivable compared to noise in a signal band having a small electric power component. By utilizing this fact, the present invention differently sets the numbers of code vectors of respective codebooks. Namely, the number of code vectors stored in a codebook 10-i for a band of large electric power component is reduced. For example, for a speech signal having a low frequency and large electric power component, the conventional codebook shows constant quantization noise spectrum irrespective of the frequency, as shown in Fig. 2(a). According to the codebooks 10-i(i = 1∼M) of the present invention, however, quantization noise spectrum increases as the frequency decreases, as shown in Fig. 2(b). With this arrangement, the total number of code vectors stored in the codebooks 10-i (i = 1∼M) can further be reduced compared to that of the single codebook structure. From this point also, the present invention can reduce the memory size of each codebook. As described above, the present invention can greatly reduce the memory size of each codebook compared to the conventional technique. According, an operation time necessary for encoding and decoding processes can greatly be reduced. The present invention will be described in detail according to embodiments for encoding speech signals. Here, the Shannon's sampling theorem establishes a relation of "q = 2 x p." According to characteristics of speech signals, a long time averaged electric power component of the frequency band from 0 KHz to 2 KHz is larger than that of the frequency band from 2 KHz to 4 KHz. This provides a hearing masking effect so that the frequency band from 0 KHz to 2 KHz may allow larger noise. Taking this effect into consideration, the number Nb of code vectors of the codebook 10-a is set to be smaller than the number M of code vectors stored in the codebook 10-b. where H is a impulse response matrix of the synthesis filter. A minimum distortion evaluating means 60a corresponding to the error evaluating means 60 of Fig. 1 finds the indices (j, k) and gain values (gLj, gHk) of code vectors that provide a minimum error squared norm Ejk. Numeral 70 denotes a controlling means corresponding to that of Fig. 1. An operation of the above vector quantization encoder of the present invention will be explained. In a first cycle, the controlling means 70 selects a code vector CL1 from the codebook 10-a and a code vector CH1 from the codebook 10-b and, in the next cycle, the code vector CL1 from the codebook 10-a and a code vector CH2 from the codebook 10-b. In this way, the controlling means 70 successively selects pairs of code vectors (CLj, CHk) from the codebooks 10-a and 10-b. Namely, it selects "M x Nb" combinations of code vectors. When a combination of code vectors (CLj, CHk) is selected, the gain means 20-a multiplies the code vector CLj selected from the codebook 10-a by a gain gLj, and the gain means 20-b multiplies the code vector CHk selected from the codebook 10-b by a gain gHk. Thereafter, the synthesis filter 30-a filters an output of the gain means 20-a and reproduces a signal wave shape XLj corresponding to the code vector CLj of the codebook 10-a. The synthesis filter 30-b filters an output of the gain means 20-b and reproduces a signal wave shape XHk corresponding to the code vector CHk of the codebook 10-b. The addition means 40a finds a sum of the two reproduced signal wave shapes and provides a reproduced signal Yjk. The speech signal error computing means 50a computes an error squared norm Ejk between the reproduced signal Yjk and a signal wave shape S of a speech signal to be encoded, and provides an error squared norm Ejk to the minimum distortion evaluating means 60a. In this way, the minimum distortion evaluating means 60a successively receives "M x Nb" error electric power values Ejk. After receiving each error squared norm Ejk, the minimum distortion evaluating means 60a resolves an equation that zeros a partial differentiation of the error squared norm Ejk with gLj and gHk, thereby finding values of the gains gLj and gHk that minimize the error squared norm Ejk. The error squared norm Ejk at this time is also found. The minimum distortion evaluating means 60a specifies the index values and gain values that provide the minimum of "M x Nb" minimum error squared norm Ejk, and encodes the specified values, thereby completing an encoding process of the speech signal to be encoded. Figure 4 shows a vector quantization decoder 200 according to an embodiment of the present invention. In the figure, the same parts as those of Fig. 3 are represented with like reference marks. An operation of the vector quantization decoder will be explained. The vector quantization decoder 200 receives codes (involving index values and gain values) from the vector quantization encoder 100. The decoder reads a code vector CLj from a low-frequency-band codebook 10-a according to the received index, and a code vector CHk from a high-frequency-band codebook 10-b according to the received index. A received gain gLj is set in a low-frequency-band gain means 20-a, and a received gain gHk is set in a high-frequency-band gain means 20-b. Thereafter, similar to the vector quantization encoder 100 of Fig. 3, a low-frequency-band synthesis filter 30-a reproduces a signal wave shape XLj from the specified code vector CLj, and a high-frequency-band synthesis filter 30-b reproduces a signal wave shape XHk from the specified code vector CHk. An addition means 40a finds a sum of the two reproduced signal wave shapes and provides a reproduced speech signal Yjk, thereby completing a decoding process of the speech signal. The vector quantization decoder 200 of the present invention shown in Fig. 4 has two synthesis filters, i.e. , the synthesis filter 30-a corresponding to the codebook 10-a and the synthesis filter 30-b corresponding to the codebook 10-b. The addition means 40a finds a sum of signal wave shapes reproduced by the two synthesis filters. As explained before with reference to Fig. 1, only one synthesis filter may be sufficient if the addition means 40a is disposed in front of the synthesis filter. As described above, the present invention arranges a plurality of codebooks for a vector quantization encoding process or a vector quantization decoding process. In addition, the present invention arranges a means for adding signals reproduced from code vectors of the codebooks to each other. This arrangement can realize the same controlling function as that realized by the single codebook arrangement. Consequently, the present invention can greatly reduce the memory size of each codebook. The present invention is not limited to the preferred embodiments explained with reference to the accompanying drawings. For example, it is allowable not to follow the gain shape vector quantization encoding technique. When this technique is not involved, it is not necessary to encode gain values. In addition, the present invention is applicable for not only speech signals but also other signals. Unlike the above embodiments, the sizes of codebooks, i.e., the numbers of code vectors and/or dimensions of the codebooks of the quantization encoder and decoder of the present invention may be set sufficiently large to meet expected maximums. And these numbers may at any time and continuously be changed depending on an instantaneous spectrum distribution of input speech signals and electric power of the input speech signals for respective frequency bands covered by the codebooks. In Fig. 2(b), the number of code vectors of a lower band codebook is set to be smaller than that of a higher band codebook. If, for example, an input signal level of an intermediate band becomes highest at one instant, the number of code vectors of the intermediate codebook may be increased at the instant depending on an electric power level of the signal. In this way, the sizes of the respective codebooks are flexibly changed. As described above, the present invention can maintain the quality of reproduced signals while greatly reducing the memory size of each codebook used for encoding and decoding processes, compared with conventional techniques. The present invention can, therefore, reduce an operation time of the encoding and decoding processes, thereby realizing a practical vector quantization encoder and vector quantization decoder. each of the separate codebooks is provided with a synthesis filter (30-1 ... 30-M). the evaluating portion (60) includes a means for generating indices corresponding to the respective codebooks as well as indices for code vectors of the respective codebooks. A vector quantization encoder according to claim 1, wherein at least one of the separate codebooks has a different number of code vectors from that of another codebooks. A vector quantization encoder according to claim 2, wherein each of the separate codebooks has a different number of code vectors. A vector quantization encoder according to claim 2, wherein each of the separate codebooks has code vectors of different dimension. A vector quantization encoder according claim 1, wherein the number of code vectors stored in any one of the separate codebooks varies depending on the frequency band of input speech signals covered by the one codebook. A vector quantization encoder according to claim 1, wherein a usable number of the code vectors of each of the separate codebooks is variable in response to a level of the input speech signal to be encoded. an addition means (40-a) is disposed to add reproduced speech signals which are provided by the synthesis filters based on code vectors provided by the corresponding codebooks, to one another, thereby decoding and generating a reproduced speech signal. A vector quantization decoder according to claim 7, wherein at least one of the separate codebooks has a different number of code vectors from that of another codebooks. A vector quantization decoder according to claim 8, wherein each of the separate codebooks has a different number of code vectors. A vector quantization decoder according to claim 7, wherein the number of code vectors stored in any one of the separate codebooks varies depending on the frequency band of input speech signals covered by the one codebook. A vector quantization decoder according to claim 7, wherein a usable number of the code vectors of each of the separate codebooks is variable in response to a level of the input speech signal to be encoded. A vector quantization decoder according to claim 7, wherein each of the separate codebooks has code vectors of different dimension.